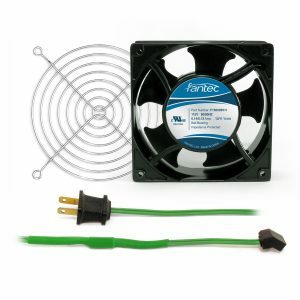 120mm cabinet cooling fan kits with a built in thermostat are excellent for keeping electronics and appliances from overheating. This quiet cabinet cooling fan from GardTec measures 120x120x38mm. The steel wire fan guard is more efficient, letting more air through than plastic fan guards. Wire fan guards are more energy efficient, because the fan does not need to be run as long. An installed fan thermostat allows the fan to turn on and off automatically at desired temperatures. 72″ fan power cord is attached to provide an excellent length for reaching between power outlets and appliances easier. GardTec provides quiet cabinet cooling fans at excellent prices to keep your electronics from breaking.